Early Spitfires rarely had any sort of major airframe differences, being more easily distinguished by engine upgrades. This was particularly true of the Spitfire V. Using basically a Mk I airframe, a Merlin 45 or 50 replaced the earlier Merlin III or XII. This resulted in a slightly different nose contour. The most widely built version was the Vb, which meant it had the B wing of two Hispano 20mm cannon and four Browning .0303 machine guns. Some Spit Vs had the outer wings clipped to improve the roll rate at the expense of higher altitude performance. The type entered service in early 1941 and served on all fronts. Some were exported to friendly countries and even at the end of the war the Spit V could be found in service. This kit comes from at least 1974 if not a bit earlier. It is molded in robin's egg blue and pretty much a simple build. 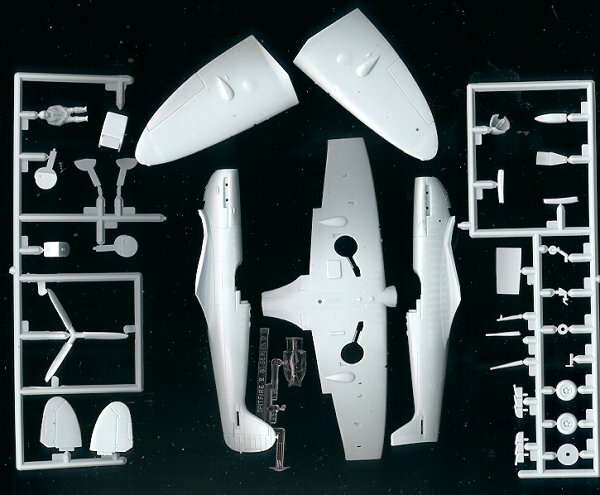 Unlike the 1/48 kits of the day, the Airfix Spit V has the proper 'gull' under the wing. It also comes with a stand (not shown) which is something one rarely sees nowadays. The only option is for the landing gear to be retracted for which a set of 'up' gear doors with wheel sections is provided. The wheel wells are not boxed in and the interior is basic, comprising only a floor, seat, rear armor plating, and pilot figure; no control stick or instrument panel. A rather odd item is that the oil cooler is a two piece construct! Main gear struts are molded in with the gear doors. Of course, the kit has raised panel lines other than the door, engine and control surface hinges. The fabric effect on the control surface is not too bad, considering we are talking about a 30 year old kit. As you can see, my original boxing is free from flash. There are ejector pin markings on a few parts (like the other side of the exhaust) and there were sink areas on the wings and fuselage opposite alignment pins and on the rather thick 'retracted' landing gear parts. Instructions are of the more modern type with pictograms for each step. 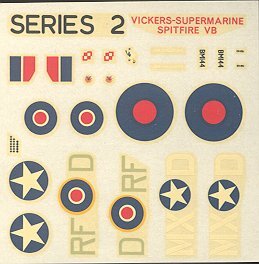 Colors are provided using Airfix and generic names. Markings are provided for two planes. One RAF version from one of the Polish squadrons and another for a USAAF plane from the 31st FG. Both are painted in the European scheme of Dark Green over Slate Grey with Light Aircraft Grey undersides (that's what it says in the instructions). Both have the yellow wing leading edge ID stripes that will have to be painted along with the sky spinner and fuselage band. The decals have yellowed over the years, but should work rather well as I've found old Airfix decals to work rather well. Most of us will trade them out for some aftermarket versions. There are modelers out there who think that if it isn't new, it isn't any good and that is just not correct. Though old, this Airfix Spitfire is still quite buildable and still among the most accurate of its type in this scale. Best of all, even new, it isn't expensive and can easily be found for a few dollars/pounds/euros at swap meets and used kit sites.